I can’t help myself… I just keep buying pumpkins. It’s a strange problem to have, but, all things considered, it could be worse. I’m not racking up credit card debt and I end up with delicious pumpkin pancakes, soups, breads, cakes, muffins …and now granola! While someone in my house is starting to get sick of pumpkin, I am NOT! In fact, the pumpkin pie I ate over Thanksgiving left me wanting to bring spiced pumpkin into my everyday life. So, I decided to use my cherry-nut granola recipe as a base for some crunchy pumpkin granola. This time around I’ve also added more fiber and chia seeds! You can read up on all the great benefits of oats in my last post, which include regulating blood sugar, lower cholesterol and supporting a healthy heart. The almonds, walnuts and chia seeds also give you protein and healthy fats that boost brain function! 1. Preheat oven to 325F/160C. Line baking pan with parchment paper. 3. In a medium bowl, mix pumpkin, vanilla, applesauce, honey, oil and egg. 4. Pour wet mixture over dry mixture and combine until combined. 5. Spread mixture over parchment paper and bake for approx. 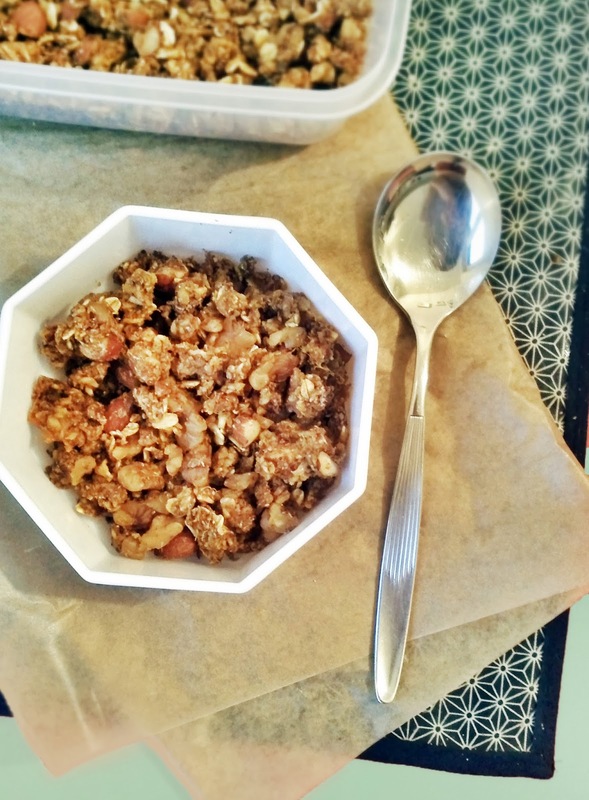 40 minutes, remove and stir the granola every 10 minutes so that it does not burn! Feel free to adjust the cooking time to how muh crunch you like! 6. Allow to cool for an hour, then store at room temperature.